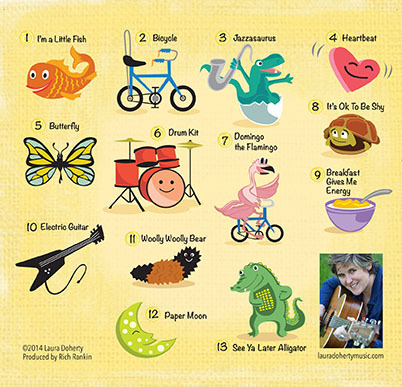 All are kid friendly with only a few lyrics that may be worth noting for vegetarian or vegan families. In the song “Breakfast Gives Me Energy” the foods referenced are bananas, blueberries, oatmeal, and yogurt. In “Paper Moon” a line in the chorus says “it’s a Barnum and Bailey world, just as phony as it can be, but it wouldn’t be make believe if you believed in me.” I think the reference is more allegorical but as Barnum and Bailey is a famous circus I thought I’d mention it (incidentally, per the album notes, the song is one of two that is not entirely by Ms. Doherty). The song “Woolly Woolly Bear” is about a caterpillar and it was surprising to me that a cocoon is involved in the transformation into a butterfly instead of a chrysalis (aside: Eric Carle, in The Very Hungry Caterpillar, actually uses the term cocoon as well). 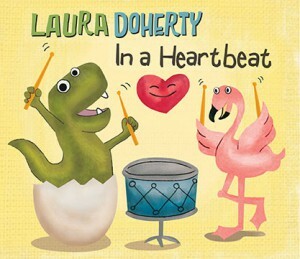 Standout tracks for our family include “I’m a Little Fish,” “Bicycle,” and “Heartbeat.” In “Heartbeat,” being able to feel a heart beat like a drum when dancing, running, exercising, swimming, etc. leads into loving someone. A sweet CD set for release around Valentine’s Day. Thank you Jessica for explaining the origins of the song, I am not well versed in jazz and I found the article interesting!